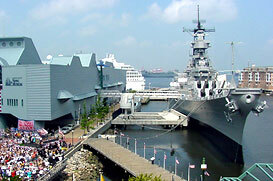 Norfolk, Virginia is a Southern mid-Atlantic seaport and a vibrant cosmopolitan center. The city has a population of 234,000, making it one of Virginia’s largest cities. Festivals, attractions, and museums are all reasons millions of visitors make their way to the city and the surrounding area every year. Its long military and transportation history is another reason it is on the map. The Norfolk Naval Base, the world’s largest naval base, and the Norfolk Southern Railway, are both at the heart of this history. The city has streets that are pedestrian-friendly, restaurants and theaters that are trendy, and white sandy beaches that are only minutes away. Norfolk has many cultural offerings, from historic churches to cultural cruises to gospel festivals. The cultural experience in Norfolk is thriving and inviting, and it can be explored through a range of attractions, events, shopping, dining, and festivals. The city is known as the arts capital of Virginia. Performances by the Virginia Symphony, Virginia Ballet Theatre, Virginia Opera, and the Commonwealth Theatre Company all add to the cultural richness of Norfolk. The Virginia Arts Festival is held in the city every April. The Chrysler Museum of Art has more than 30,000 original pieces of art. Punk, funk, and rock and roll bands can bee seen at the NorVa Theater, and the Naro Cinema showcases the latest in independent film. There are many opportunities to catch sporting events or participate in leisure and recreational activities in Norfolk. The Lake Wright Golf Club offers the public a beautiful 18 hole, par 70 course. The American Hockey League’s Norfolk Admirals play in Norfolk for hockey fans. The city has a Recreational and Community Services division which hosts a variety of events and offers a range of activities to residents. There are two pools in operation year round and two other seasonal pools. The neighborhood parks and school grounds are located within the city’s park and parkway system. Many Recreation Centers are located throughout the city and are dedicated to enriching the quality of life for the residents of the city. There are also a number of dog parks in parks and open spaces throughout the city. There are many parks in Norfolk that give residents the chance to experience the great outdoors year round. Barraud Park has softball fields, playgrounds, and picnic shelters. Lafayette Park, one of the oldest parks in the city, offers scenic pathways and a boat ramp. Lakewood Park has nine tennis courts, two lighted baseball fields, and a playground. Northside Park features many walking paths, a wading pool, and outdoor basketball courts. The city also has three beach parks that give residents the opportunity to enjoy many aquatic activities. Ocean View Beach Park has lifeguards on duty in the summer, a boardwalk, and plenty of green space. Norfolk offers an array of exciting nightlife and something for every taste. Jillian’s downtown is a “playground for grown-ups” and features a video game room, billiards lounge, 2 dance clubs, and 2 restaurants. BAR Norfolk is an all-out party spot with a College Night every week and DJ Dancing every night. The Have a Nice Day Café has a 70s theme and features disco and rock music. Dixie’s Tavern has food like po-boys and etoufee and attracts an after-work crowd. The NorVa has brick walls, hardwood floors, and balconies, and it Ringo Starr and James Brown have appeared at its Concert Hall.